Rubén Quintanar, 27, was hailed a hero after he rushed in to save a fallen friend and was gored to death during a village fiesta in Valencia on Saturday. 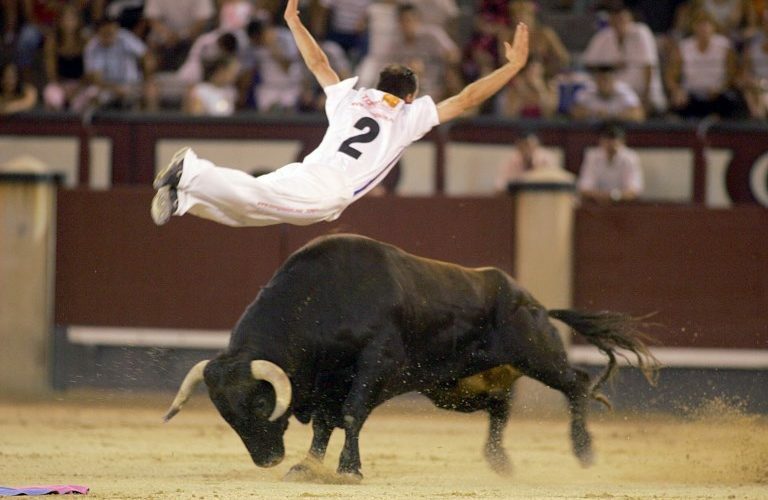 Tributes poured in for Quintanar, an accomplished recortador –an acrobat who leaps over bulls in a non-violent alternative to bullfighting – after he was gored to death during a fiesta in Paiporta, a village 5km from Valencia. According to reports, Quintanar rushed in to attempt to distract a bull as he charged towards a fellow runner who had fallen during the encierro of a ‘bous al carrer’ when bulls are released to chase revellers through the streets. But he was gored deeply twice in the chest when the horn pierced his lung and ripped into his heart. He died shortly after arrival by ambulance in the Hospital La Fe in nearby Valencia. Quintanar, who was from the nearby village of Torrent, was a familiar face at village fiestas across the region and was described as “one of the great” recortadors – an art that unlike bullfighting involves no capes or swords but involves dodging the bull using gymnastic moves. The annual fiestas were cancelled as a result of his death.